Leo Santa Cruz will make the fourth defence of his WBC super bantamweight title against Jesus Ruiz on January 17 - in what looks like an easy night for the Golden Boy fighter. 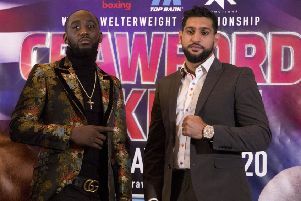 Santa Cruz defends his title in Las Vegas in a co-feature headlined by heavyweight title holder Bermane Stiverne, who will be making the first defence of his title against mandatory challenger Deontay Wilder. Unbeaten Santa Cruz has mentioned Carl Frampton in dispatches over the last few months and he says ‘The Jackal’ is in his thoughts after he takes care of Ruiz. “I feel great about my upcoming fight with Ruiz. “He is a strong fighter, undefeated in the past two years and the kind of opponent I want to fight,” Santa Cruz said. “I want to put on a great show in Las Vegas on January 17 and show boxing fans that I am a strong fighter ready to go to the next level and take on the top fighters in the division. “Guys like Guillermo Rigondeaux, Scott Quigg, Carl Frampton and Abner Mares. Frampton would love a unification fight with Santa Cruz - but the Tigers Bay puncher has to defend his IBF title against Chris Avalos at the Odyssey on February 28 before he can target Santa Cruz later in 2015.